When Froelich disappears from the fourth-tallest ladder in the world, his nephew's quest to find him interlaces with the journeys of two spunky young women who outwit their guardians. In a Wild West populated with immigrants, skittish Civil War veterans, hungry clouds, a circus menagerie, and a few murderers, this fairy-tale twist on the American dream explores the conflict between loyalty and ambition, and the need for connection, even at the highest rungs. Jamie Duclos-Yourdon, a freelance editor and technical expert based in Portland, Oregon, received his bachelor's degree from Colby College, and his MFA in Creative Writing from the University of Arizona. His short fiction has appeared in the Alaska Quarterly Review, Chicago Literati, and others, and he has contributed essays and interviews to Booktrib. 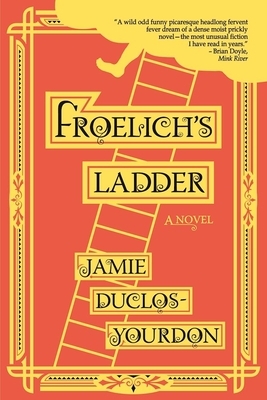 Froelich's Ladder is his debut novel.